A valid account is required for access to Avi Vantage through the Avi UI, REST API, or CLI. User accounts can be maintained locally in Avi Vantage or remotely on an authentication, authorization, and accounting (AAA) server. To configure or manage Avi Vantage user accounts, one needs a user account having write access to the Accounts section of Avi Vantage. This is defined by the role assigned to the user account. The admin user account is a unique account used for initial setup of Avi Vantage. This account cannot be deleted. To view the Avi Vantage user accounts that are in its local user database, navigate to Administration > Accounts > Users. 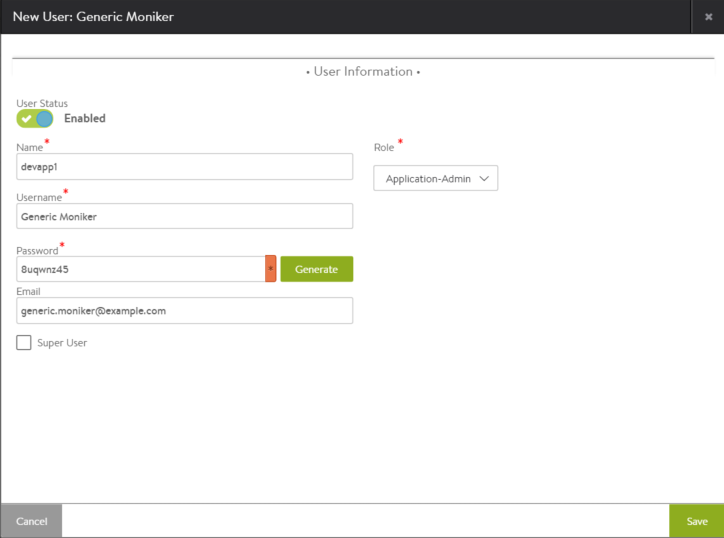 Username – The account name used to log into Avi Vantage through its management interfaces: Avi UI, REST API, or CLI. Status – Status of the user account. Full Name – Full name of the user. Email – Email address of the user. Role – Access settings (write, read, or no access) for each type of resource within Avi Vantage. Last Signed In – System time on the Avi Controller when the user most recently logged in. Delete – Removes the selected user accounts from Avi Vantage. Suspend – Deactivates the selected user accounts. A suspended user cannot access Avi Vantage through any of its management interfaces. When the user attempts to log into Avi Vantage, a notice is displayed to inform them of the account suspension, and access is denied. Activate – Re-activates the selected user accounts. Navigate to Administration > Accounts > Users, and click on Create. Name – Full name of the user. Username – Name that the user will supply when signing into Avi Vantage, such as jdoe or jdoe@avinetworks.com. Password – You may either enter a case-sensitive password in this field or click the Generate button to create a random password for the new user. Email – Email address of the user. This field is used when a user loses their password and requests to have it reset. See Password Recovery. Role – Areas of the Avi Vantage system to which the user account will be allowed access. For each system area, the role defines whether the user account has read, write, or no access. Avi Vantage comes with predefined roles. In addition, users who have write access to the Accounts section of Avi Vantage can customize the predefined roles and create new roles. See Roles. * If the user will need to have the same privileges as the admin account, select the Super User checkbox. * Click on Save. The new account appears in the user account table.